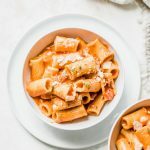 This vodka rigatoni is made with a simple vodka sauce and is a great way to switch up your regular pasta night. Add oil and garlic to a dutch oven or large pot and stir for 2 minutes or until garlic is fragrant. Then, add tomatoes, milk and vodka and stir to combine; last, stir in the parsley, salt and red pepper flakes, place a lid on top and simmer sauce for 15 minutes. While sauce is simmering, cook the pasta in a separate saucepan. Once the sauce is done, slowly add in the cheese and stir until it’s melted. Then, use an immersion blender to blend the sauce until it’s smooth. Alternatively, you can pour the sauce into a blender and blend it up that way. Pour sauce over top of cooked pasta, then add extra parmesan cheese and/or red pepper flakes to taste. Serve pasta with broccoli steaks as a side (optional but so, so good). *If you can’t find fire roasted crushed tomatoes, use fire roasted diced tomatoes. Fire roasted adds more flavor!